I had a very fast turnaround to the airport with less than three days home from the UAE heading off to Europe. However, we had a German TV crew at CCF filming for their show “Waisenhaus für wilde Tiere” so we anesthetized and brought to the clinic D’Artagnan, one of our male cheetahs, who needed treatment for an injured leg. My European Tour began with a lecture to conservation biology students at Kent University through the help of Niki Rust, one of my PhD students, and several meetings with her professors. 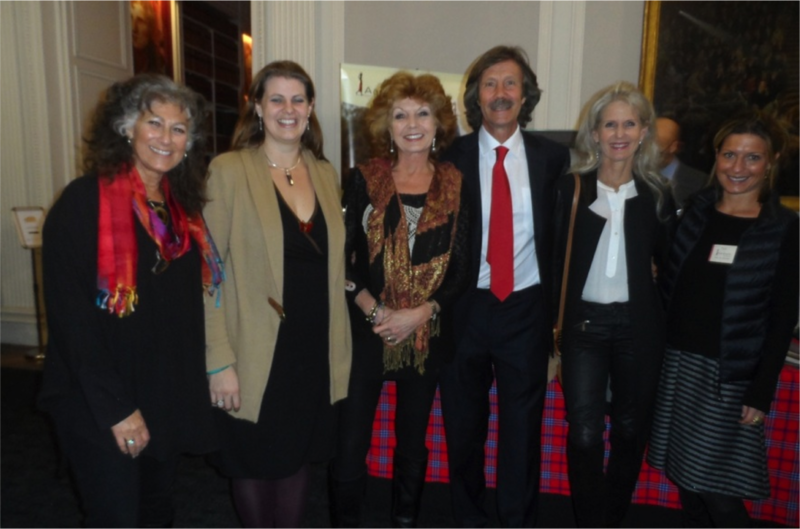 The next day was the big CCF UK fundraising event at the Royal Institution in London with Jonathan and Angela Scott from Big Cat Diary. The night was a success for the cheetah with over 200 people joining us! In London I was invited to the Illegal Wildlife Trade reception, convened by the British Government. I met with colleges and government official from across 50 counties. CCF collaborated with ZSL’s (Institute of Zoology) Cheetah & Wild Dog Conservation Planning Process with a poster highlighting the illegal pet trade on cheetah. I then traveled to France, where, in Paris, I met with past volunteers and supporters. I then headed to La Fleché with Catherine Ebbs-Perin, the president of our French support group Amifelin, for a media interview and then a private dinner with CCF supporters, hosted by Pasquel Fournie from Fous de Nature at ‘Moulin des Season’. The next day, over 100 people attended our CCF Cheetah Conference and film viewing hosted by Pasquel Fournie. My next stop in France was Nantes Veterinary School. Annually, CCF has interns that come from this school and we hope that many more will come to Namibia. When I arrived in Holland, long-time supporter and my close friends the Louwman family of Wassenaar Wildlife Breeding Centre, picked me up from the airport and took me to a lovely dinner. I was able to meet with Simone Echardt from our support organization, Stitching SPOTS. The next day, I went to Van Hall University in Leuwarden where I was greeted by over 100 students and a number of past interns. It was great to reconnect with them. I then went to Germany to meet our German cheetah colleagues from AGA, Birgit Braun and Teresia Rebitschko. We had several meetings including a meeting with Namibian Tourism Board and with Roland Melisch, the Director of TRAFFIC’s Africa & Europe programs where we talked about the rising problems around illegal live trade of cheetah. Heading out of the continent, I was given a special behind the scenes tour of the Frankfurt airport detection dog training program, which includes using the detection dogs to find, among other things, wildlife and wildlife products. As I arrived home I met up with Ryan Sucaet (Assistant Cheetah Keeper) and Matti Nghikembua (Senior Ecologist) with a film crew from German TV’s educational programme “pur+” at Erindi Private Game Reserve for the rerelease of Athena into the wild. The next day, Ryan reported that Athena had settled well and had already made a wildebeest calf kill. With all my travels, it is nice to be back home in Namibia.